Live happily ever after with whimsical, brushed steel tampon cases that keep personal items organized in your carryall. Choose from one of three illustrated fairytale damsels by Caia Koopman: Thumbelina, Little Red Riding Hood or Little Bo Peep. Made in Los Angeles.Each holds three regular tampons. Absolutely unique and a piece of a art to carry with you. This artist created a carrying case that will incite questions of its origin everywhere it is taken out. I was looking for a 'unique' gift for the woman that had everything...well, almost everything...this was such a unique, humorous, practical, cute gift that was well-received with appreciation and a few laughs. Who doesn't need an attractive case to take your mind off of bloating, chocolate cravings and the need to take someone's head off? Highly recommended! This Makes A Great Gift!!! We All Spill Our Purses Once In A While,This Little Holder Provides A Secure,Clean, And Private Place For Those Little Necessities!!! This is a cute, classy, low key way to store tampons. You can take it with you and not everyone has to know what you are carrying. Very neat idea! I purchased it because of the image on it and because I needed something like this but it was cheaply made when I received it. It's not very durable and it didn't line up so it didn't close. The picture/image was of better quality than the rest of the case. I just didn't think it was worth the pricetage. Practical & Stylish - Love It! I received one of these cases as a birthday gift from my sister a couple years ago & recently bought one as a gift for my daughter's birthday. We both love them. My case has been getting banged around in a large bag for the last 2 years & still looks & works great (& the artwork is lovely)! True to the description, the case holds 3 tampons (super plus, with applicator). Normally, I would not have paid [$] for a tampon case, but after receiving & using mine, I found it was definitely worth the price. This case is really great...unless you plan to use it to store tampons! I was so disappointed to find that this case would not hold any of my tampons. The description says it holds 3. Yeah, 3 golf pencils maybe, but not 3 tampons! So I tried 2, then 1, but no luck. The problem is not the length/width, but the depth. I tired several different tampons from my multi-pack and had to force the case to close. The only tampon I can imagine this case holding is some teeny, tiny, "tween" tampon without an applicator. While I appreciate the artistic nature of the case, I think it's sad that it wasn't engineered to hold a variety of types or sizes. I think it's sad that now not only do we all have to be a size zero, but we all have to use the same tampon too! Now I have to pay to send this back- what a waste! 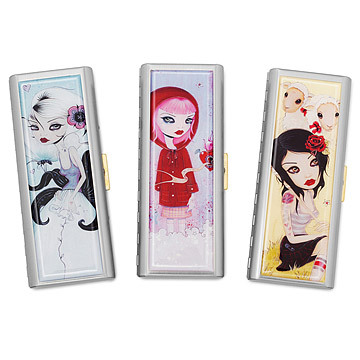 Live happily ever after with whimsical, brushed steel tampon cases featuring Little Bo Peep, Little Red Riding Hood or Thumbelina.